I like to hike, and I have two large dogs (German Shepherd, Presa Canario). After a long hike I look reasonably homeless (long hair, unshaven, muddy). Combined with two large, potentially dangerous dogs, it might scare off some people. How can I make sure we do not scare people / make them more comfortable meeting us on the trail? When passing people put the dogs on the opposite side of yourself so that you are between the dogs and the people. Pull off to the side and have the dogs sit, as this demonstrates that you have control over the dogs and they will listen to you. How long have you been out for? Smile and generally be friendly towards people. As someone who is fine with dogs, I'm saddened that my son was nipped by a puppy when he was very young and is now very nervous when needing to walk past dogs, and there are lots of strays where I live. In time, I hope to help him react to dogs in a different way, but right now he is afraid of them. If you met him with your dogs, there is nothing you can do that will change that. As a dog owner and lover, that might not sit very comfortably with you. But you would only be able to minimise his exposure and fear towards your dogs. Charlie gives good advice on showing you have control, but if you stopped to talk to my son whilst your dogs were obediently sitting by your side, he'd still be scared. If you recognised that and asked "Are you scared by my dogs?" and were prepared to cheerily move on without taking it personally if the answer was "Yes", then I would say you've done all you reasonably can. I know I'm focussing on the title of the question, because the details show you're looking to accomplish something a bit different, but I wanted to make the point: some people are just afraid of dogs. Though you don't actually state it, I get the impression you normally let your dogs roam free on your hikes. If this is correct, then you are taking a very large risk with other people's health and welfare. Both your dogs are large and very capable of inflicting significant injury on even an adult human. Dogs will react violently if they feel threatened or if their hunting instinct is aroused. You cannot predict with certainty how your dog is going to react if someone suddenly comes round the bend. Perhaps they are laughing loudly, or they suddenly scream because a bee flew into their hair, or maybe they are bleeding from a scratch. Any tiny thing could surprise the tiny mind of a dog and trigger its primal reflex - you will not be able to predict this or be able to control it with a verbal command, no matter how much you think you know your dogs. Even if your dog only wants to be friendly it can still injure a person. As you probably have observed, dogs show affection by muzzle-licking. Since our muzzles are high up on our bodies, dogs have to leap up on us to reach them. A large dog like one of yours, will send a child flying if it leaps on it at speed. I understand you want to live the free life of roaming the hills with your trusty doggie companions but the reality is that you risk serious injury to some innocent passer-by. Please reflect on this and leash your dogs. The most important thing is keeping all dogs on-leash in public areas. Technically, you can't make any person not feel afraid. But a leash will do a lot to reassure someone who is frightened or concerned, so they know they can maintain a physical distance according to their comfort level. I've also known some people who have had a traumatic experience with a dog, and sadly, are going to be afraid of any dog no matter how sweet or friendly. Some people are autistic and just don't like to be touched by anyone. Young children may be startled to encounter an unfamiliar dog, and become terrified when they realize there is nothing to stop it from jumping on them if they back away. Etc., etc. In all of these cases, it's not a personal thing against you and your dogs -- honest! So please don't take it that way. There are just some people who, for whatever reason, won't want to get up close and personal with your dogs -- and that's okay. There's no need for you to prove how friendly your dogs really are, or for us to explain why we don't want physical contact. For people like us, the best reassurance of all is that your pups are on-leash, so that we are free to initiate contact (or not) on our own terms, as our needs allow. Both in Central Europe (where I'm from) and traveling Canada I've only once in my life encountered a "visibly" and truly homeless person in the "outdoors" (actually just outside my home). All other encounters with homeless persons I personally had took place in cities and typically quite downtown. From that observation: I'd say the risk of confusion with homeless person would be maybe highest at a train station on the way home. The one point that would make me wary (both outdoors and in town) would be beer/alcohol smell. Many people have commented already: some people are afraid of dogs, and typically more so of large dogs. And some are allergic to dogs. While most people I meet locally outdoors are used to dogs (ask interested questions, walk their own dog, ... - we're rural area [for Germany] that is nice but not so exciting people would come here for a day hike from anywhere else) I expect to meet more dog-inexperienced people in more "famous" regions. ignoring people looking/staring at the dog (still somewhat difficult: if someone is looking at him, that means dog should make friends with them, right? If someone is staring, dog needs to pacify the staring person. Maybe by licking the hands?s => which will then go up, so dog should jump to reach them, right?). Expose him to crowds (group hikes - obviously after making sure beforehand that everyone is OK with this). With that he also has to endure strangers petting (it happens that grown up strangers pet him who did not ask beforehand! - I had totally expected this of kids, but not of grown ups). The goal is: dog knows he has to ignore humans, regardless of whether they ignore him or not. Same with kids. Fortunately, there's a "forest-kindergarden" coming along regularly and about half of the kids love petting him and giving him treats [he loves that, too] - the other half is somewhat inexperienced/reserved or even a bit scared but the group is large enough that each kid can decide how close they'll be to the dog. The kindergardeners (or I) then explain a bit about dogs and everyone learns something. I train him walking with a halter for two reasons: in case we want to go by train, he's officially required to have a muzzle [the halter counts in some regions like a muzzle] and I want him to get used to having such a construction in his face. Second reason is: with the halter, also my 70-year-old mother is in perfect physical control of 60 kg adolescent dog of a cart-pulling breed. Halter isn't as bad as muzzle, but I do get questions whether he's dangerous [sometimes adding: although he looks so friendly] when the halter is on - people understand that I want him to be used to halter/muzzle so he can come on the train. BTW: He's not "one of those breeds" - but: but for the white parts of the coat, they look quite similar to Rottweilers, and I get asked every once in a while whether he's a Rottweiler mix. 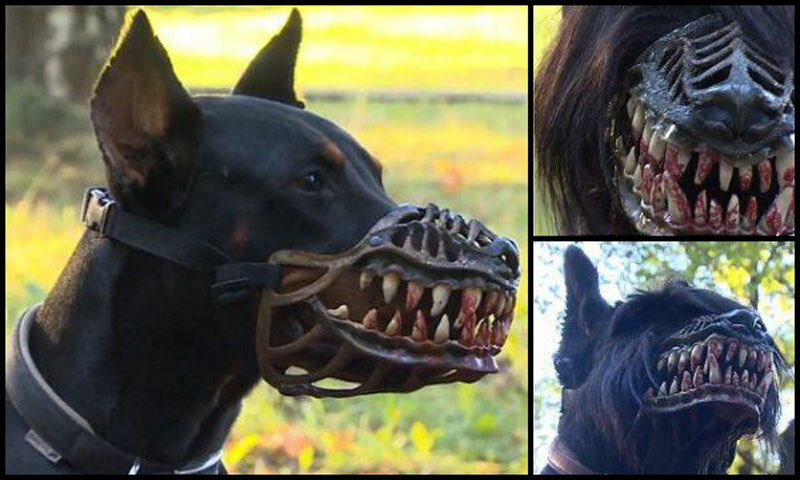 For this question: So, yes, people may be extra scared of a muzzled dog. Maybe depending on local customs about muzzling: here only very few dogs are muzzled. "Those breeds" and "problem dogs" are required to, and so is any dog in trains etc. who isn't inside a bag (but dog on train is comparably uncommon). In contrast, leash is the norm. All dogs in all public areas must be kept under control at all times. If your dog goes toward other people, it is not under control and must be kept on a leash, as others have said. In my experience, the only dogs that are under control of accompanying humans without being on the leash are service dogs and other working dogs (such as guide dogs for the blind¹ (unlikely to find on a hiking trail, although I did once meet a blind hiker on a narrow hiking trail along a steep slope)) and hunting dogs. I've met plenty of hunting dogs in nature, and they all seemed to totally ignore me. I'm afraid of dogs (including Liams “sea sponge”), but I don't mind hunting dogs. They appear to be true professionals. And that's for the better, because keeping a hunting dog on a leash would be impractical. A hunting dog may startle me but as it ignores me it will not scare me. For any other kind of dog, I have rarely if ever experienced that an owner was actually in control. Therefore, the advice in other answers applies: your dog must be on the leash at all times, because you almost never know for sure if other hikers are near. ¹Of course, guide dogs for the blind are always on a very short "leash" (I don't know the correct word), I mean that I haven't seen that the human needed this "leash" to stop the dog from going to other people. Unless your dogs are well behaved (will sit on a single command and not move) then address the dogs and distract them. Grab them by the collar. If the people don't bother you then the dogs are not likely to be bothered. If the dogs will sit then leash them and order them to sit to the trail side. I don't see a need or benefit to engage the people other than hello. You want to teach the dogs that trail people are of no concern. Consider a dog vest or one of those cute outfits women dress up there pets with. Always have your dog on a leash and under control. Make sure you have water and a treat available anytime you are out doors. 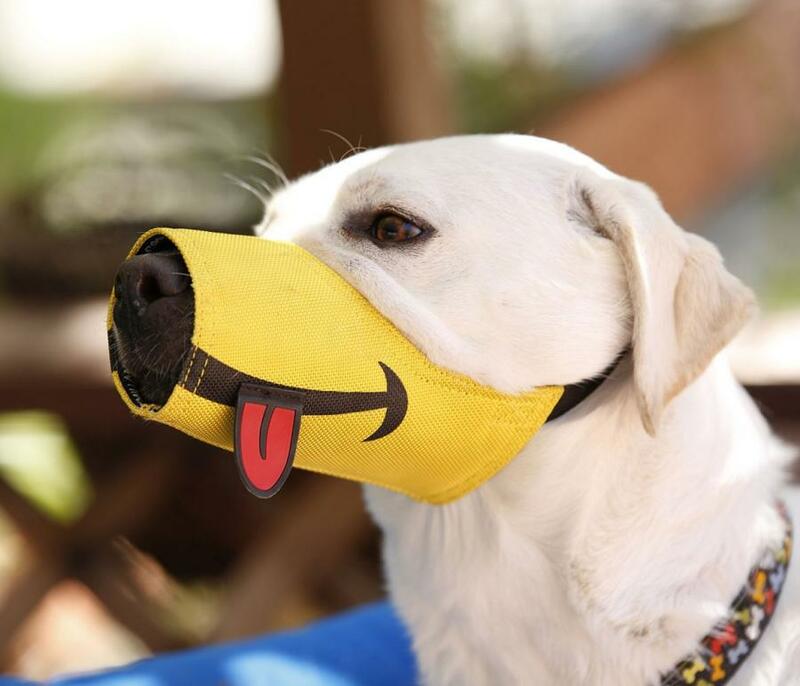 Get a visible dog muzzle, so people clearly see that your dogs are harmless. I read a leash as maybe saying, "The owner doesn't trust this dog unleashed"; and no-leash as saying, "This is a well-behaved dog." That's if I can assume that the dog-owner is competent. IMO it's just as good (as using a leash) to demonstrate your control by giving "sit!" or "heel" or whatever else. Ideally your dog is looking to (looking at) you for instructions, in which case I can ignore the dog and talk to you. If the dog is looking at me and trying to make its own mind up, then maybe I'll avoid all y'all (so that the dog stays closer to you than to me). The important thing (the only important thing) is to be safe. It doesn't matter so much whether I'm scared of the dog and/or want to talk with you, the most (or only) important thing is that I mustn't be attacked. I tend to use a leash only for safety's sake (not to punish the dog, not to make people feel happy) and/or to comply with the law. The other bit ("homeless, long hair, unshaven, muddy") is maybe a bit more important than the dogs. I'd like to suggest a different approach than the majority which seem to suggest that dogs shouldn't ever get to go hiking without being leashed. Be able to read other people's reactions and body language to gauge whether they're interested in 'meeting' your dogs or not. Train your dogs to ignore strangers and stick close to you when passing others unless you tell them it's okay to say hello. If you're not sure on the first point, assume they don't want to meet your dogs. Personally, I love to meet dogs out walking, and I'll always say a 'Hey, pup' or something like that - it should be obvious if someone else is keen for a pat, just as it's obvious if people want to chat or keep walking without stopping. The idea that dogs must always be leashed in public really saddens me. Yes, some people are afraid or allergic - and that's totally legitimate - but dogs are part of our world, and I think it's perfectly appropriate that they are governed by manners rather than ropes and muzzles. As a hiker, you have the right to expect that you're not licked or bitten by someone else's pet in public, but I don't agree that that translates to every pet needing to be tied to its owner at all times. Not the answer you're looking for? Browse other questions tagged hiking backpacking dogs etiquette or ask your own question. How to tie a one-piece webbing harness for dogs?